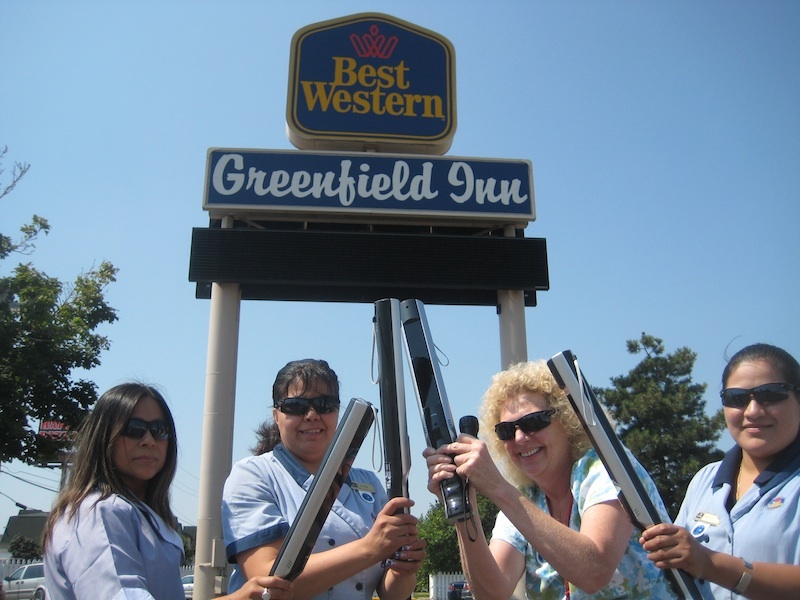 On July 11, 2012, the BEST WESTERN Greenfield Inn scored a near perfect score on the housekeeping section of a Best Western Quality Assurance Audit. The housekeeping department at the hotel was awarded the BEST WESTERN Housekeeping Certificate of Achievement for losing fewer than 10 points on a 1000 point scale for cleanliness issues. In preparation for the inspection the housekeeping staff at the hotel was trained in BEST WESTERN’s I Care Clean program. The program requires the housekeeping staff to implement the use of ultra violet sterilization wands into their cleaning process. The wands ensure the sterilization of high-touch areas in the guest room such as toilet seats, clock radios, telephones, and pillows. The housekeepers also began using black lights to help identify less visible cleanliness issues. In another effort to help improve cleanliness standards, the hotel replaced their conventional television remotes with “Fresh Remotes” – special units that are seamless and easy to clean. The BEST WESTERN Greenfield Inn is located at 3000 Enterprise Drive in Allen Park (at I-94 Exit 206). The hotel recently received a TripAdvisor Certificate of Excellence for consistently achieving outstanding traveler reviews. Please visit the BEST WESTERN Greenfield Inn’s website for more information.